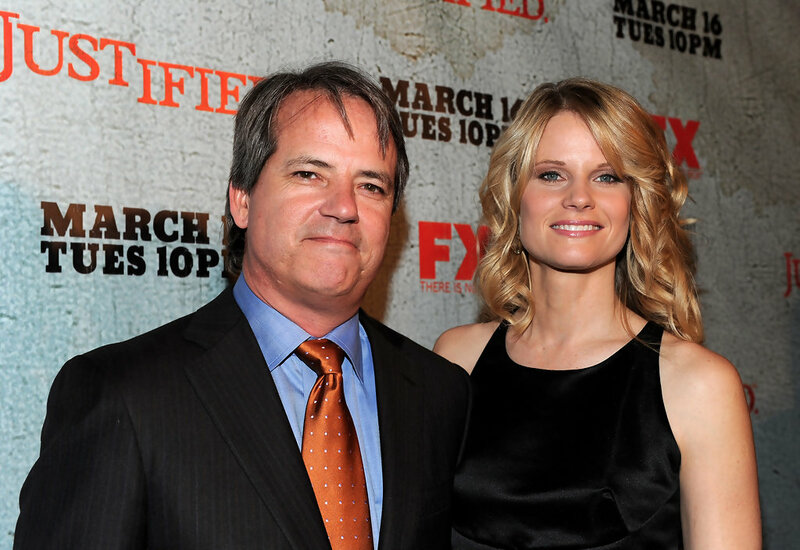 JUSTIFIED show runner Graham Yost (IMDb), pictured above with Ava Crowder herself, Miss Joelle Carter, talked a little about the fourth season at the New York Television Festival last night, and Entertainment Weekly has all the highlights. He gives some new information about Constable Bob, the character Patton Oswalt is playing, and reveals that four episodes have been written with another two percolating in the pipeline. Neither Dickie Bennett nor Dewey Crowe have popped up in the stories so far, and another segment of Raylan Givens creator Elmore Leonard’s novel RAYLAN will be adapted in some form or another for the new season, though Yost wouldn’t reveal which one. He also says he sees the series ending after its sixth season. Obviously we’d be happy to have this show around forever, but it’s always good to go out on a high note, and Yost says he wouldn’t want the show to ever become “Elmore light,” which I respect. From a writing standpoint, he also shares some entertaining insights into his Hollywood career, including humble, humorous stories about writing SPEED and courting Johnny Depp for what became the Christian Slater role in BROKEN ARROW. Be sure to click the link and give it a read! And, for those of us who can’t wait to own Raylan’s third season adventures on Blu-ray, we’ll be able to buy that set on December 31, which seems kind of ridiculous since you’d think they’d want it out in time for Christmas. Oh, well. You can see the poorly airbrushed cover art at Blu-ray Dot Com.